Well, we're now the proud owners of a second home! 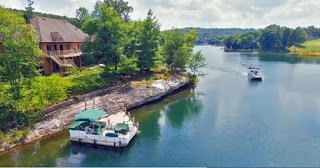 I guess I'll need to change the name of my blog to Life on the Lake! Mr. Hillside drove a rental van full of books, fabric, and a few furniture pieces while I drove my van loaded with project boxes, fabric shelving, and sewing equipment/supplies left over from last week's retreats. As soon as all the documents were signed we started moving in. His first order of business was getting cable and wifi installed. 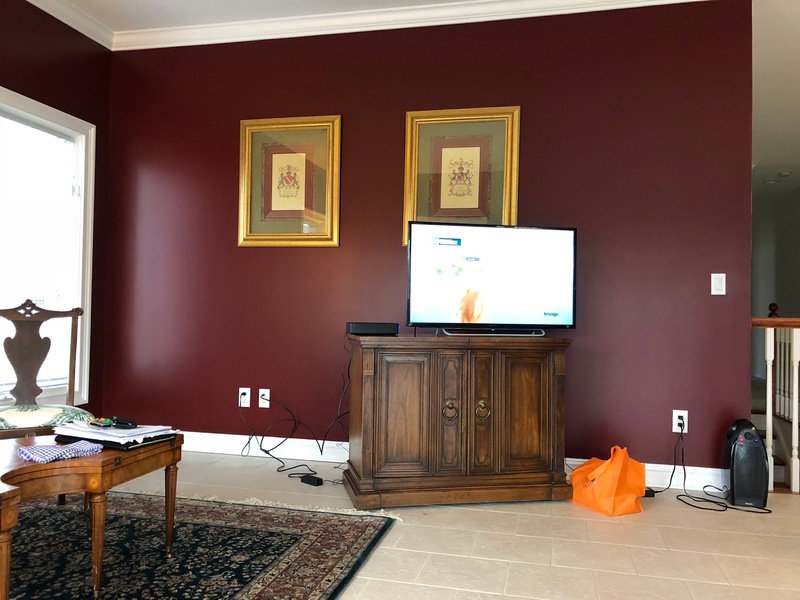 A few pieces of furniture came with the house, that bar the TV is sitting on included. But not the pontoon boat in the lake picture! My first order of business was checking out the view from my sewing room. 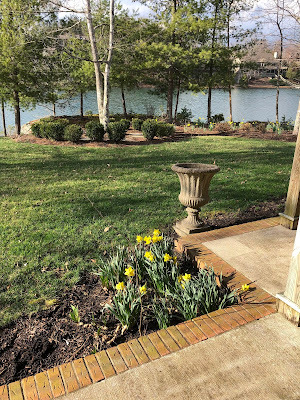 All the daffodils were in bloom throughout the garden and I can see a few irises peeping up next to the step. We had a couple of near-catastrophes that were quickly resolved by the local utility and a plumber. While we had great plans for getting my fabric unloaded so that we can reuse the boxes, it turns out we forgot to pack the shelf support brackets! Oh, well, a task for next weekend when we return with more of my sewing (s)crap. First, thanks to all of you who are going along on this journey with me. I hope you enjoy this little venture and that you are inspired to go further with the block! As I said before, for this exercise you need no more than two fat quarters, one light and one dark. A suggested cutting diagram can be found HERE. 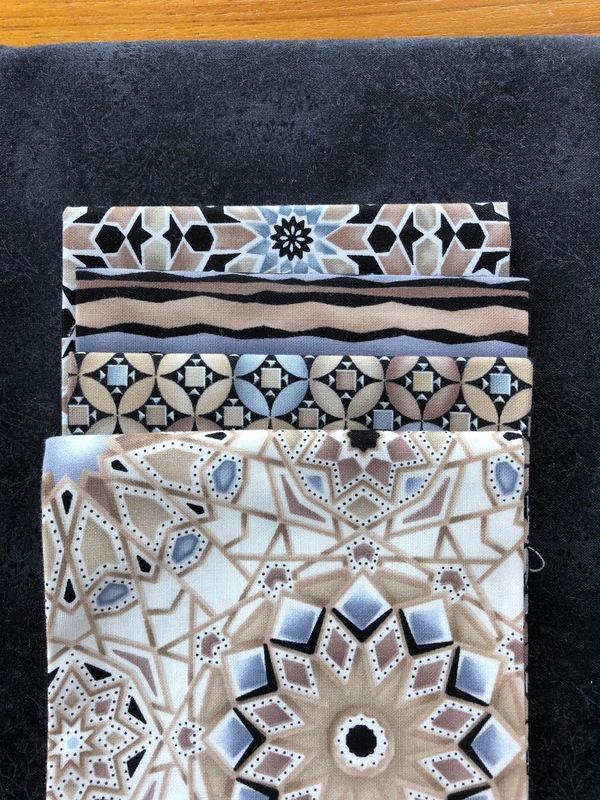 But I hope you will be inspired to go a bit further, so let's talk a bit about fabric options. Contrast between light and dark is the key. 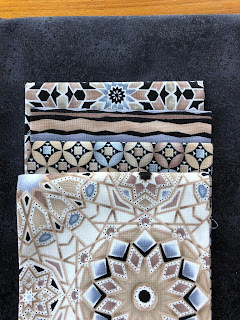 You can use just two fabrics, as long as there is enough contrast to make the design obvious. I frequently use a designer's collection of fat quarters that contains both light and dark. Pictured below is what I will be using for my examples. In this case I'm using a collection of medium-light FQs paired with a single dark background. 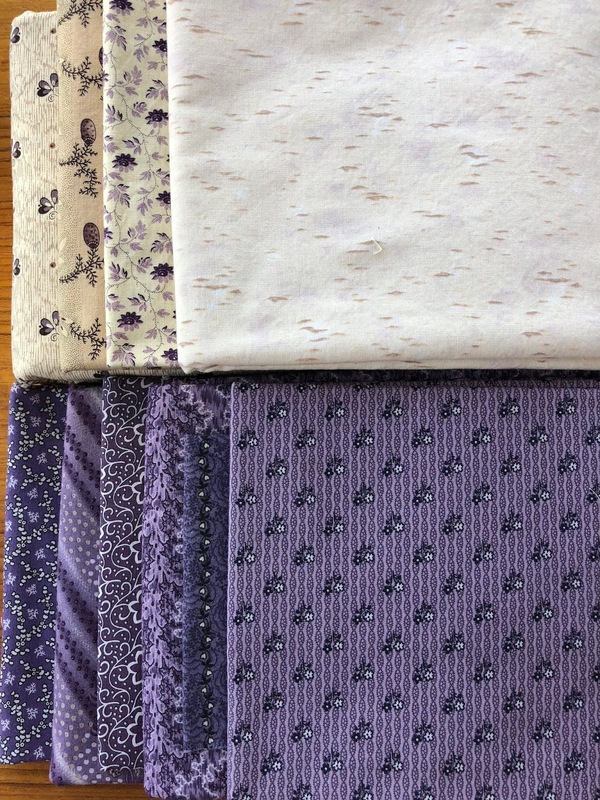 In the past I have also used a selection of fat quarters in a single color, paired with a group of light FQs or a single light fabric (think of it as background) from yardage. 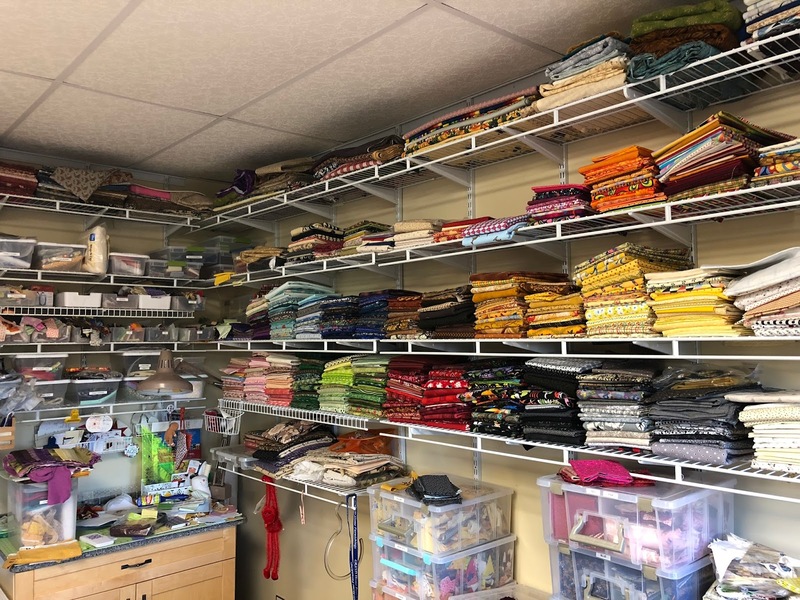 So, how much fabric will you need for a quilt? The blocks finish at 8". 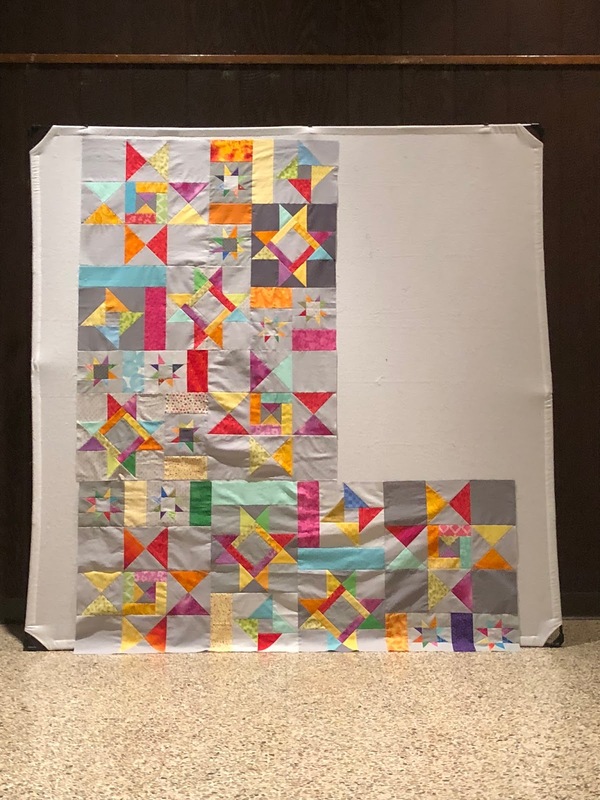 To make a whole quilt, just calculate the number of blocks you will need to make the size you want. For example, a 6 x 7 setting will require 42 blocks and will make a 48" x 56" quilt. 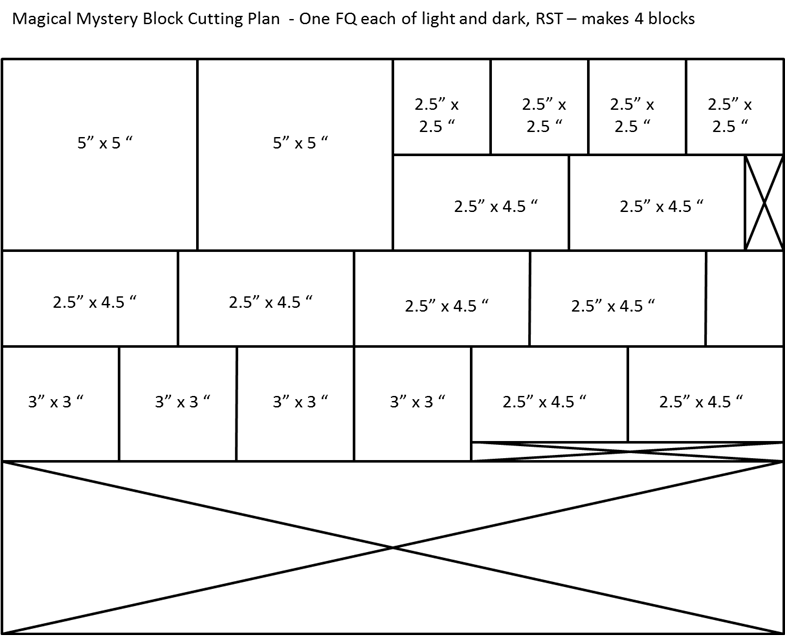 Figure you can get at least 8 blocks out of 1/3 yard (WOF) of each of two fabrics (if you ignore my cutting diagram and cut efficiently). 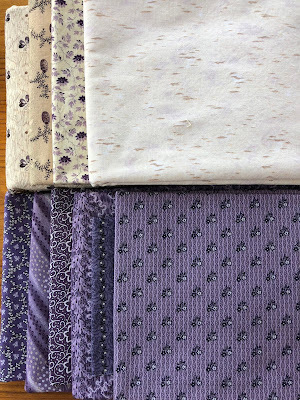 In other words, a 6 x 7 setting (48" x 56") would require about 2 yards of each fabric (or the equivalent in FQs or scraps). This block would work well in red, white, and blue for Quilts of Valor. I can also see it totally scrappy, either coordinated by color, or just by value contrast. I can't wait to see what everyone comes up with! Remember, this is an exercise in learning a new block (with multiple setting options). We are just making 4 blocks and each clue will take no more than 30 minutes. The next clue will appear on Friday, March 2. Linking with Monday Making at Love Laugh Quilt. If you missed the teaser for this fun quilt-along, you can find it here. 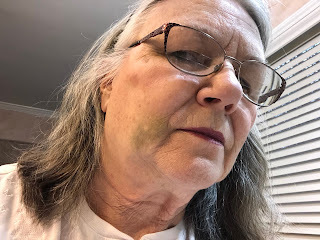 My apologies ... my tablet died last week with all my prep notes and I left town without the printed copies so I will do the best I can to get you started. Remember, for the purposes of this mystery, ALL you need is one light fat quarter and one dark fat quarter. This is enough to make four 8" blocks. HINT: Keep your chunks right sides together to facilitate sewing. I am still working on how we will link up each week. The clues will appear on Friday, giving you the weekend to work through them and some way we'll share on the following Monday. I look forward to seeing where you go with this inspiration! Thank you in advance for participating. 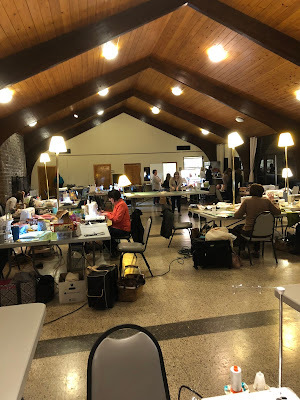 Last weekend I spent two days with the Music City Modern Quilters at a nearby state park. Aside from having a lot of fun, I managed to finish one project. I also got three-quarters of the way into assembling Starfall, which I had started in January 2017. I put the finishing touches on it at the Nuts and Bolts retreat in Kentucky this week. Quite a departure from my usual, huh? 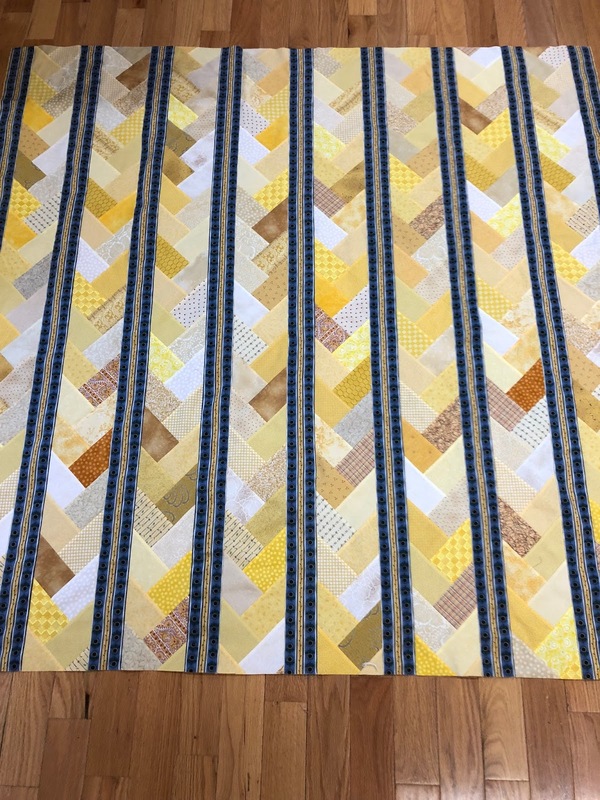 A lot of bright scraps went into this one! An oldie-but-goodie made an appearance; I call this one Sunflower Braid. The braid was started in a Power Cutting class with Debby Caffrey many years ago and stayed in the box until I finally found a suitable fabric to be the separator strip. I'm not sure if I will add anything to the top and bottom. My last near-finish is Eventide, a Miss Rosie pattern that quite a few folks were working on several years ago. The colors are a lot more subtle than what shows in this photo. 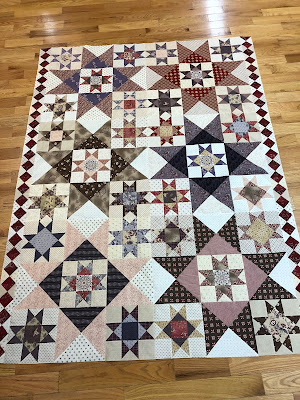 The pattern calls for another column of Ohio stars on each side. I have the blocks made; I just ran out of time as I had to head home early. More on that later. 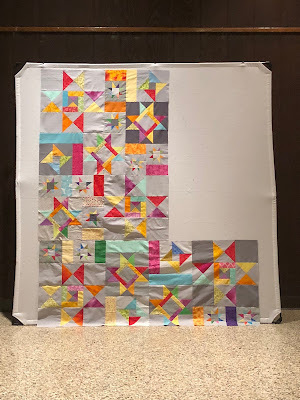 While I have your attention, let me remind you about a mystery block quilt-along I will be hosting next month. Check back here this Saturday to get the details! Get ready for an intriguing adventure! On five Saturdays in March I will lead you through a series of clues to create my Magical Mystery Block. The mystery is how two different blocks can be made from the same pieces. And the magic is in the multitude of setting options. Each clue will take no more than 30 minutes to complete, some as few as 10 minutes. 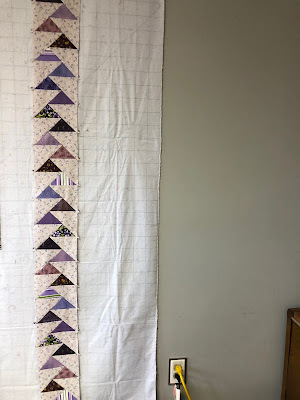 To follow along, the minimum you will need is two fat quarters, one light and one dark, enough to make four 8" blocks. Of course, you can make more than four blocks! I will give you more specific fabric requirements for multiple sizes in the Introduction. Be sure to check back here on Saturday February 24 for complete details and cutting instructions. 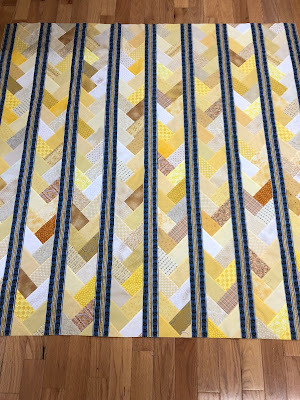 These blocks are great for group quilts. Tell your friends about the mystery and get them to work along with you using similar fabrics. All I ask is that you not provide them copies of the instructions, but rather direct them to this site to participate. I look forward to seeing your results in the upcoming weeks. CAUTION: This block has been known to be habit-forming! 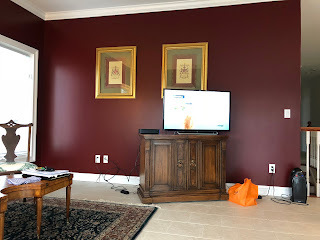 Linking up with Oh Scrap. The Music City Modern Quilt Guild is retreating this weekend. 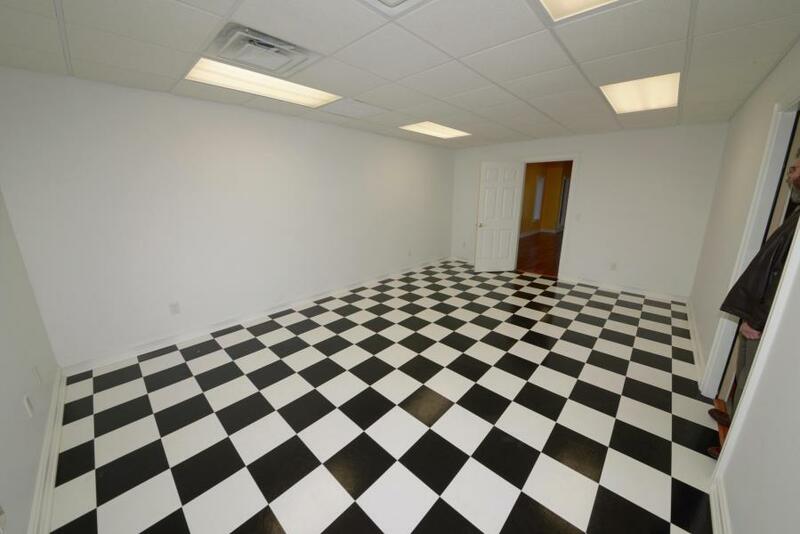 The place is spacious, but note the supplemental lighting! We are a resourceful bunch. Lots more folks have joined us today and the room is full of laughter, conversation, and the hum of sewing machines. Yesterday I was able to put Top Notch Diamonds together. All the blocks had been made and the layout done at home. Assembly was in diagonal rows. Hard enough when you have square blocks on point. But the diamonds about caused me to pull out what few hairs I have left. Cut my corners a bit on the small side so I may replace them after I've had a few days to think about it. Working on another modern quilt today - Starfall. Hoping to have a finished flimsy by tonight. It's rained here for two days so it's been a great time to stay in and sew. No, Mr. Hillside didn't beat me up; the dentist did when she prepared two teeth for crowns on Tuesday. I'm still black and blue, but at least can now see out of my right eye. Driving back home across town after two hours with my mouth jacked open was definitely challenging! 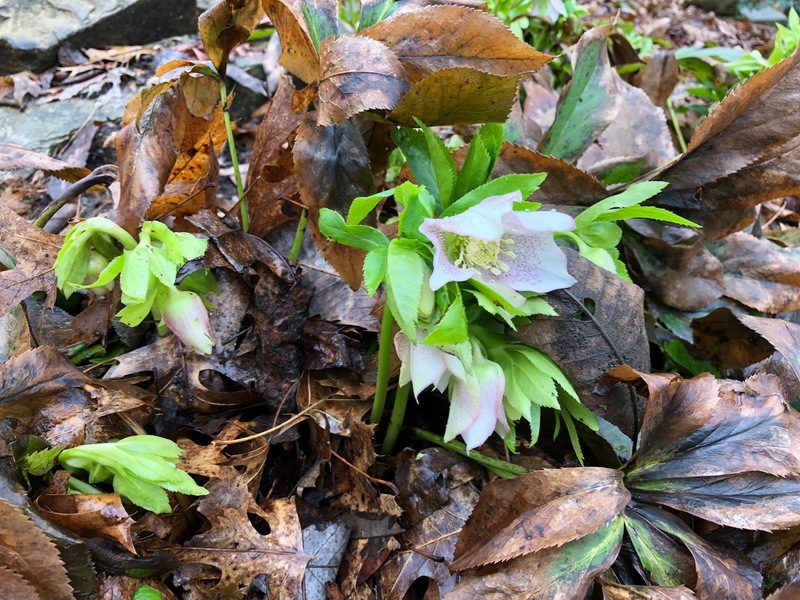 It's not unusual for the Lenten Roses to bloom in February. After all, today was the first day of Lent! 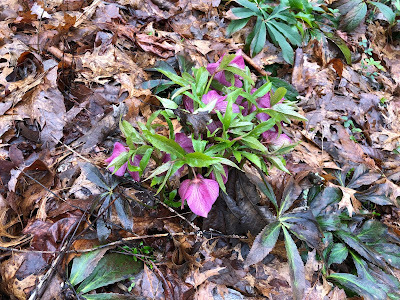 but I'm always elated to see these beauties in bloom. They were blooming when we first looked at this house this time 10 years ago. 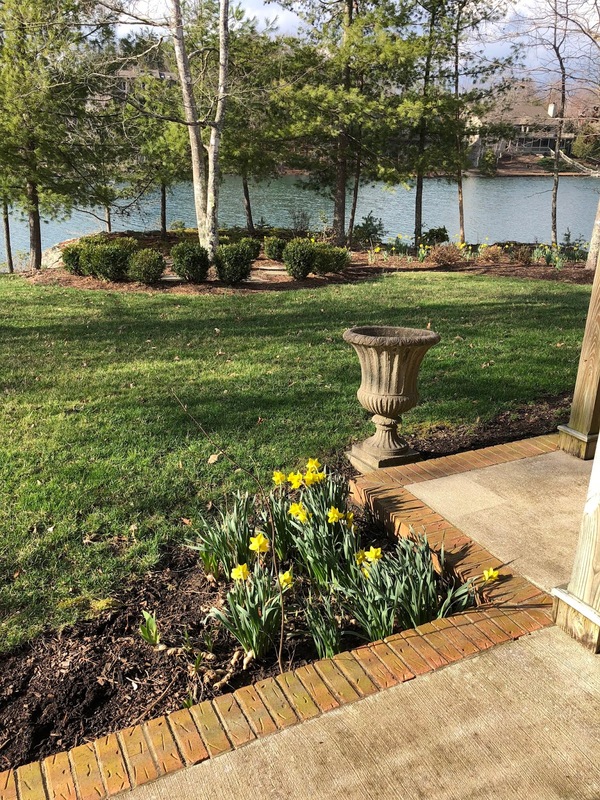 But what first caught my eye this week were the daffodils. 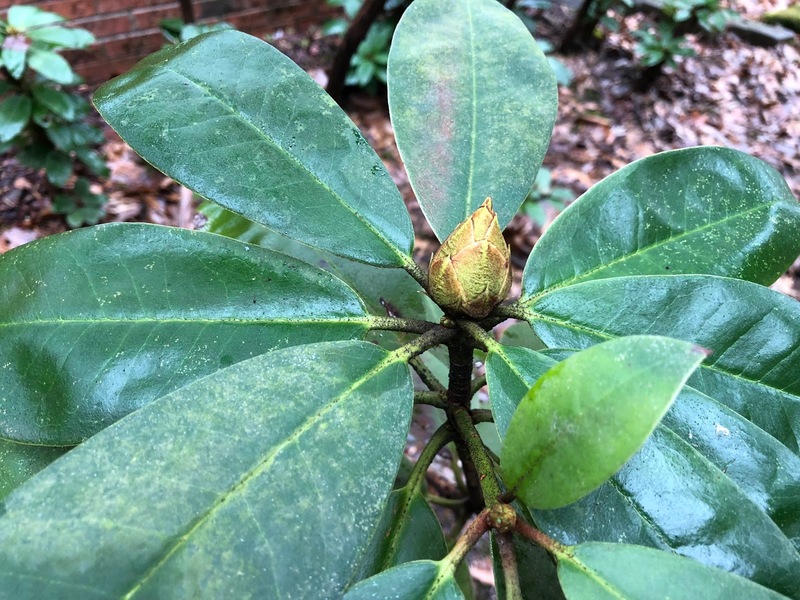 Not only are they up about 6", one is ready to bloom. 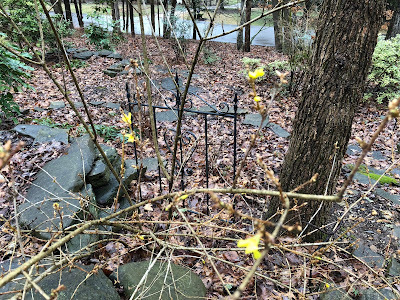 The forsythia will not be far behind. I'm never quite sure if these buds on the rhodedendron will be blooms or leaves. This is definitely one part of living on this hill I will miss! to accompany the Rainbow Scrap Challenge 2018. As I mentioned in a recent post, I did January's block in February's color. So February's block should be in January's color, light blue. I decided all of my sampler blocks would be in jewel tones. 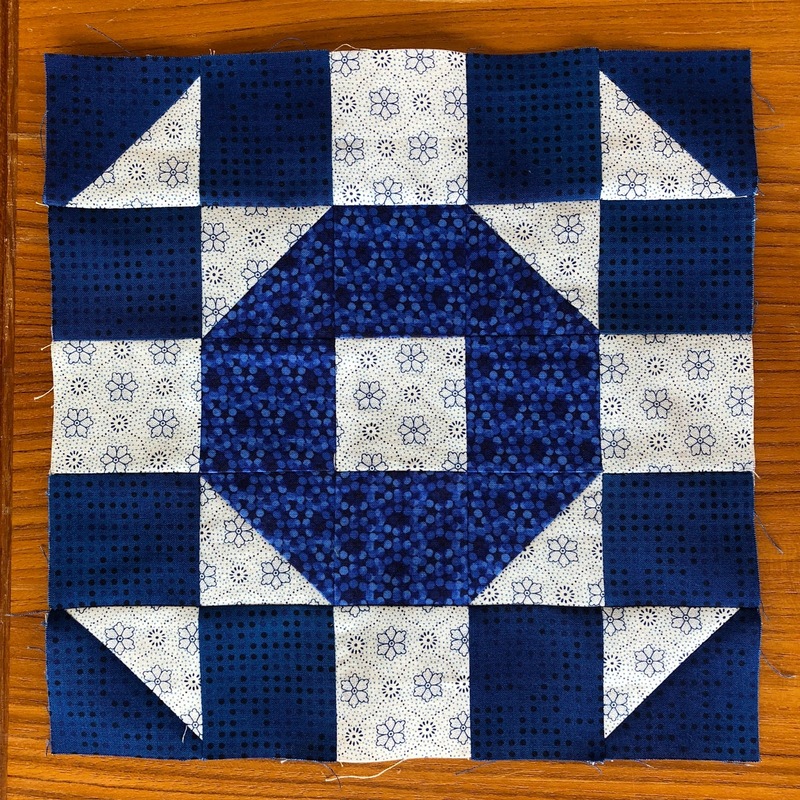 So I did February's block in dark blue. I am making the 10" size which, so far, is working well with my collection of 2-1/2" strips. I can cut the HSTs from them using the Easy Angle ruler. I will be linking with Angela at soscrappy when the weekend rolls around. At Saturday's church women's breakfast, the subject was LOVE, naturally, with Valentine's Day on the horizon as well as Lent. At recent breakfasts I have been sharing the love with women who have not only meant a lot to me, but have given a lot to our church. 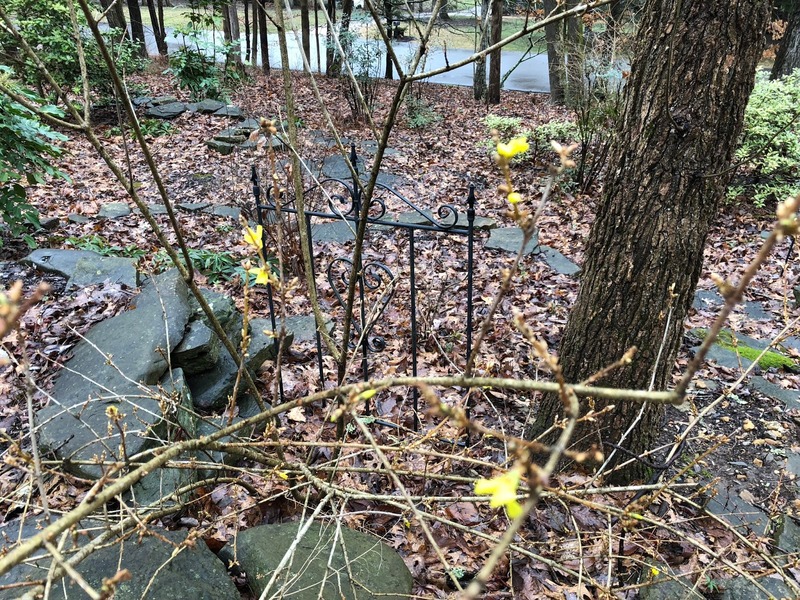 This month I chose to honor a women who is consistently cheerful (even though she lost her husband last year), always positive, and always makes me feel special. I couldn't get her to stop crying long enough to smile for the camera. When my mother passed away in 1979, her good friends discovered from each other that each one thought The Mama was her own best friend. Julia is that kind of person. In fact, one of the ladies said that very thing about Julia on Saturday. Julia makes you feel like you are her best friend and she sincerely means it! There's been a lot of secret sewing going on the last couple of weeks. But nothing I can show since it's related to the Magical Mystery Blocks Quilt-Along I will be hosting in March. Read more about the mystery QAL here and plan to come back on February 24 to join in the fun. 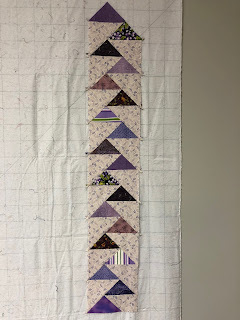 ... the second column of geese for my Rainbow Scrap Challenge project! The purple geese are now in the box with the blue column. While cleaning up one day I also cut green squares to be ready whenever green is the color of the month. So far I've filled 14 boxes with fabric and one with batting. Mari at The Academic Quilter has created a block-of-the-month (also known as a BOM) quilt-along to coordinate with the Rainbow Scrap Challenge 2018. You can learn more about it here. 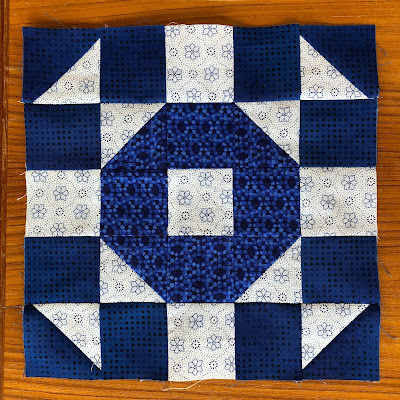 I wasn't able to get around to January's block while I had the blue scraps out. And I couldn't find my print-out of February's block while I had the purple scraps out. 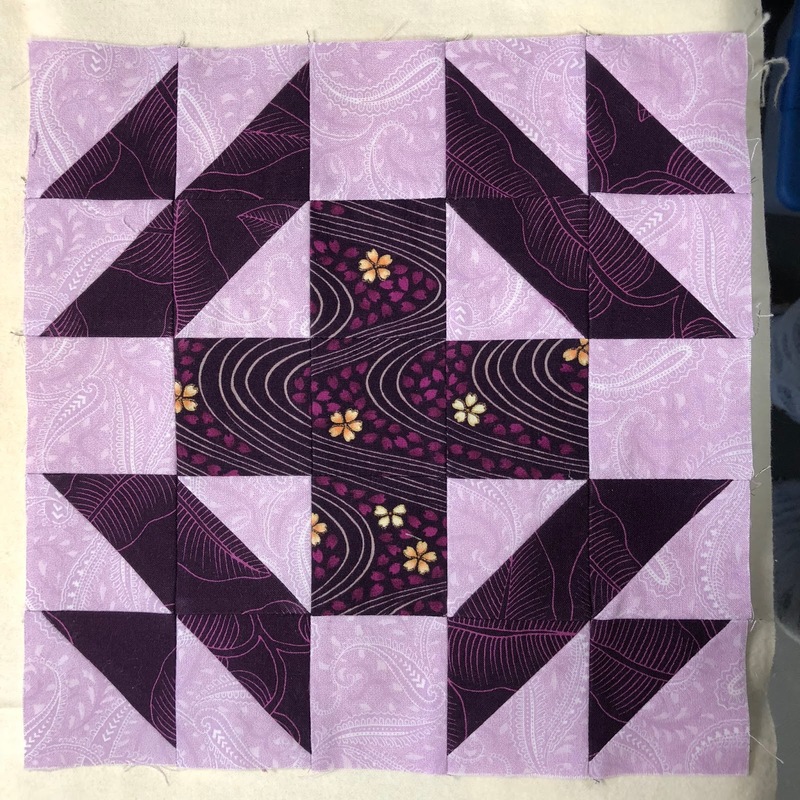 So I made January's block, Red Cross, with February's color, purple. When I get the time I'll do February's block, Wishing Ring, in blue. My blocks will finish at 10". I was thrilled to learn the Rainbow Scrap Challenge color for February is purple or lavender. 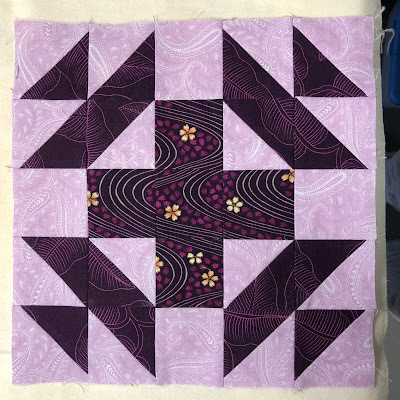 Having gone through several purple phases in my quilting past, I am blessed with lots of purple scraps. My dilemma with my block choice this year -- Goose on the Loose -- is that a 5-1/4" scrap is required for the geese so I find myself cutting into some fat quarters to get that size. But, hey, a scrap is a scrap. Last month I cut all my background squares for the rest of the RSC 2018 so I only had to find 9 purple squares. 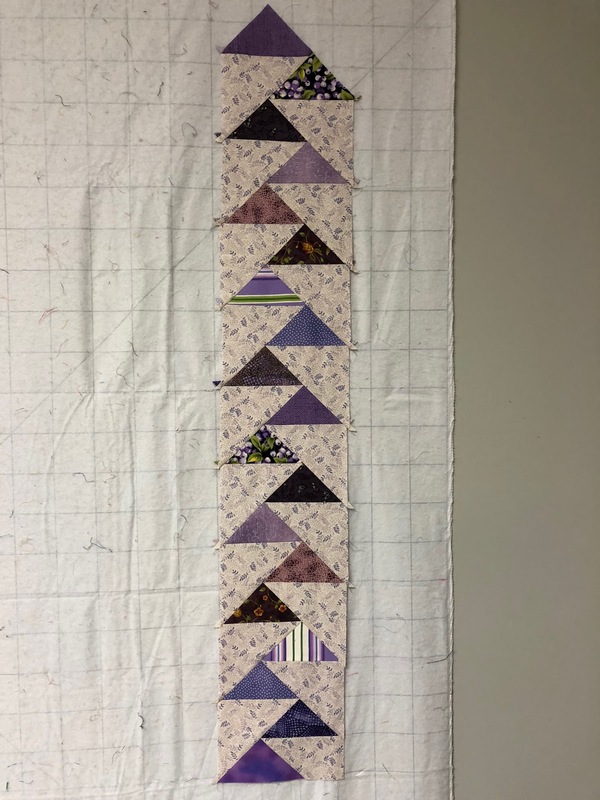 Three days into the month and I have half a column of purple/lavender geese. 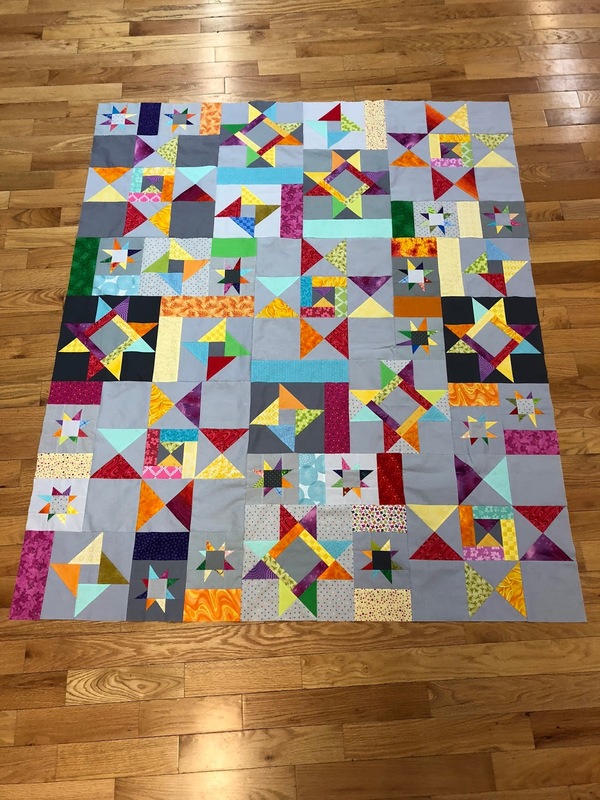 I want to host a mystery block quilt-along in March. Could it wait till a more convenient time for me? Yes, but since I think the block(s) mesh well with Sarah Craig's Hands 2 Help challenge at Confessions of a Fabric Addict, I want to get it out in March. Learn how to set up a linky party. Anyway, consider this post as addressing #1! On five Fridays in March I will introduce a series of clues to create my Magical Mystery Blocks. The mystery is how two different blocks can be made from the same pieces. And the magic is in the multitude of setting options. Each clue will take no more than 30 minutes to complete, some as few as 15 minutes. To follow along all you will need is two fat quarters, one light and one dark, enough to make four 8" blocks. Of course, you can make more than four blocks if you want to! 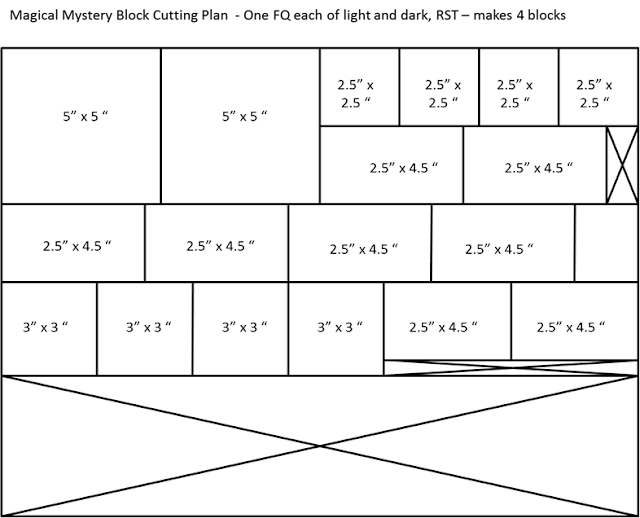 I will be providing yardage requirements for various quilt sizes as well as fabric suggestions. 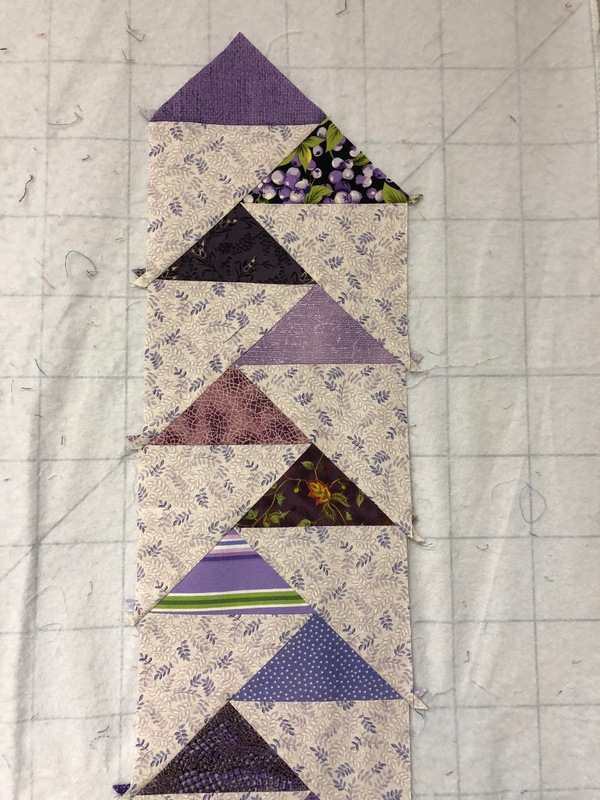 This is a great block for group quilts, so tell your friends about the mystery and encourage them to work along with you using similar fabrics. CAUTION: This block has been known to be habit-forming! So be sure to check back here on Saturday, February 24, for complete details and cutting instructions. 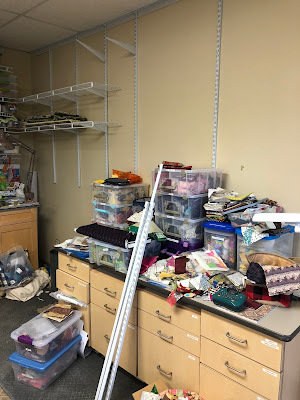 Linking up with Sarah at Confessions of a Fabric Addict and Patty at Elm Street Quilts. 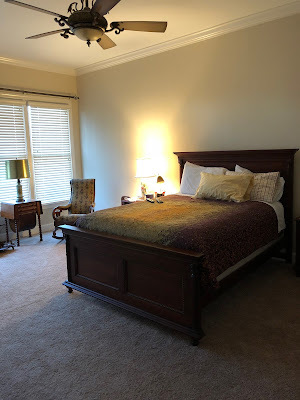 the master bedroom finally has been relinquished to its rightful owners. It's only taken us 9 months to get to this point. First, we had to find a home for all of MIL's medical equipment. 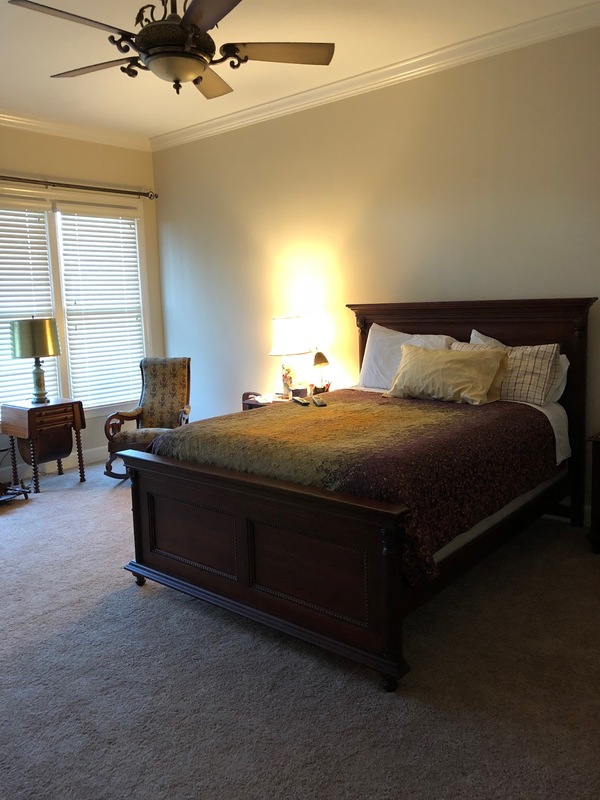 Then we had to replace the sheet vinyl flooring we installed for her when we moved in to facilitate general cleanliness and movement of her wheelchair. Then the painting commenced. Then the room became the repository of many things while the rest of the house was painted. There was the recent addition of blinds on the windows. Oh, and there were a couple of major holidays along the way, too. 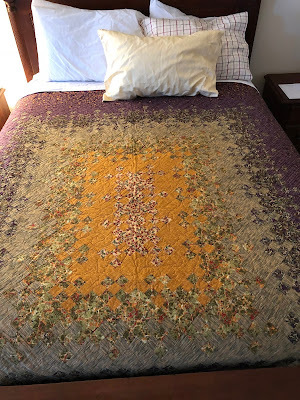 The bed has my favorite quilt on it -- Blooming 9-Patch (pattern by Blanche Young), the biggest (maybe second biggest) quilt I've ever made. I don't remember what type of batting went into it, but it has the lightest, most flexible hand. 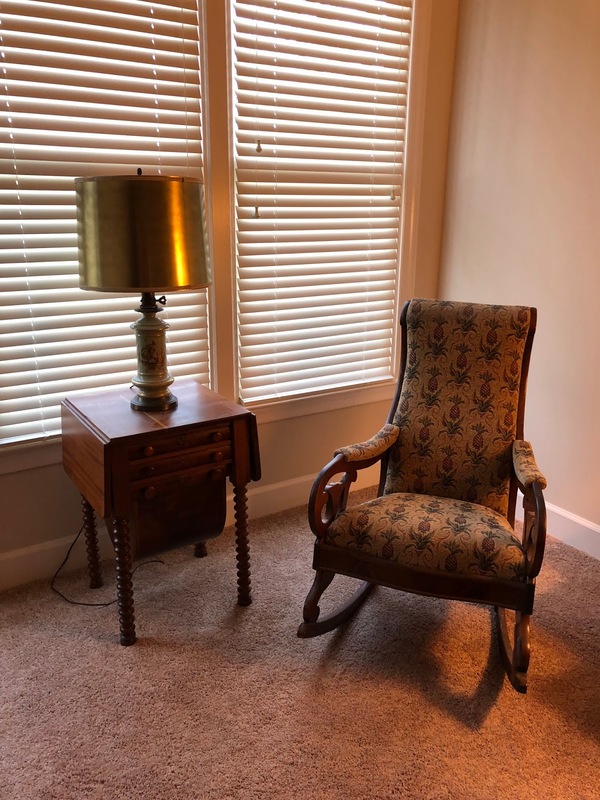 This little corner with the antique rocker and antique sewing table will be my slow stitching spot. All finished just in time to list this house for sale. On Wednesday we made an offer on a house in a resort community 100 miles east of here and the offer has been accepted! Those of you who have followed me for several years know that this has been an up-and-down ride. And the ride is not over yet! 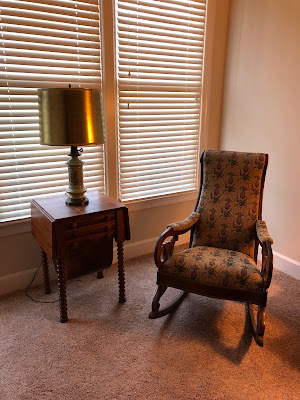 Don't be anxious if I'm absent from the blog over the next few months as we start the move. 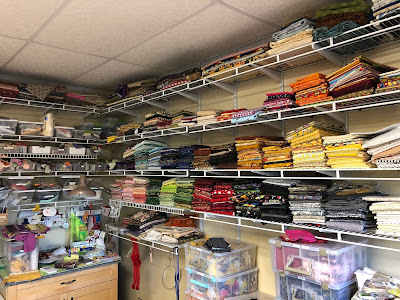 Here's a little preview, though -- the cutest fabric room ever! It was an exercise room for the former owners. The attached bedroom, visible through the door, will be my sewing room. 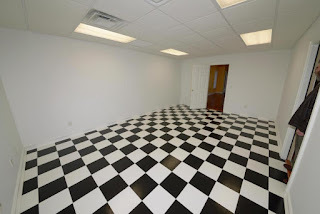 Solid surface floors in both rooms will make cleanup easy!